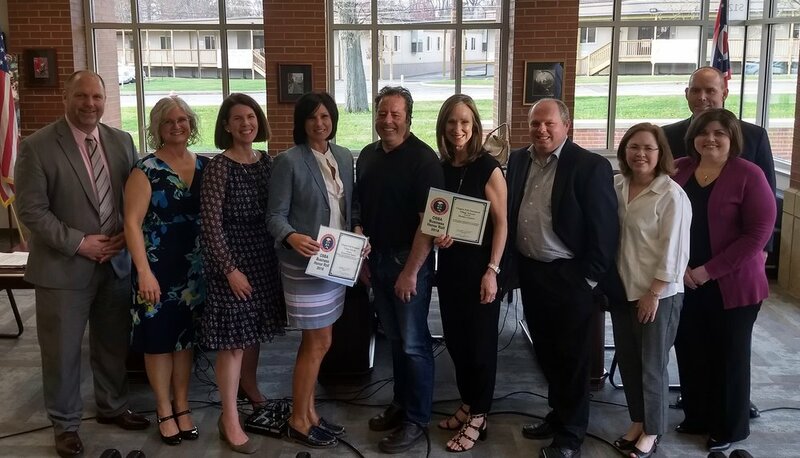 Burntwood Tavern was recognized for their partnership with Chagrin Falls Schools at the May 2 Board of Education meeting. Burntwood Tavern received the Ohio School Boards Association (OSBA) Business Honor Roll recognition. Businesses large and small, corporate-owned or family-run, play a key role in supporting the community and local schools. From helping schools with in-kind or financial contributions, donating to scholarship programs and supporting extracurriculars to offering internship opportunities, volunteering in the schools and sponsoring field trips, businesses contribute to schools in many ways. This is one way Chagrin Falls Schools thanks business partners each year. The firefighter’s job is to rescue people, pets and property, but on Friday, members of the Chagrin Falls department will be on the job to save their own fire station as they work for tips as celebrity bartenders at M Italian and Burntwood Tavern. All gratuities collected from 5 to 10 p.m. event and the online “virtual tip jar” will be donated toward much needed fire station improvements. Chagrin Falls Fire Chief Frank Zugan promised that he and his team of firefighters will put on their best bartenders’ charm to help raise the remaining $350,000. A fingers-crossed groundbreaking date will be sometime in late June, he added. Donors are asked to visit www.crowdrise.com/cffd-bartending to support the effort by selecting a firefighter/bartender they wish to tip, make a tax deductible gift in his or her name and join them for a libation at the restaurant to which they are assigned. The firefighters and the times they will be at which restaurant will be posted on the website before Friday. In addition, a number of community personalities, retired firemen and other notables – including past and current mayors of the department’s coverage communities – have added their names to the cause and will be seeking fire station donations. The fire department is operated by the Chagrin Falls Suburban Volunteer Firemen’s Association, a nonprofit corporation providing 24-hour, 365-days a year fire protection and emergency medical services to residents and businesses in the villages of Bentleyville, Hunting Valley, Moreland Hills, South Russell, Chagrin Falls and Chagrin Falls Township. Partnering toward the goal is local businessman and restaurateur Bret Adams and his Chef Art Pour Restaurant Group. “It is our obligation, and we welcome the opportunity to pay it forward in the community in which we work and live and give back to our fire department which was there supporting us from the start,” Mr. Adams said in a news release announcing the group’s participation. According to Chief Zugan the fire station “is in desperate need of a renovation, and we greatly appreciate the fine people at M Italian and Burntwood Tavern for volunteering to host a fundraiser on our behalf. The fire station upgrade project is separated into three phases. The first is a police and fire department wellness center in the basement of the Shute Building next door to the fire station. The $100,000 cost of the first phase was funded entirely by Chagrin Falls Township resident John Lennon. The second phase is a two-story addition that will include women’s dormitories and bathroom, locker room, a new kitchen, upgraded training room, storage areas and a faster access way to the apparatus bays. Third phase is an additional apparatus bay to be built between the fire station and Shute Building. It will house department vehicles currently stored outdoors year around. “As of today (March 5) we have currently raised another $175,000 towards our goal leaving $325,000 remaining,” Chief Zugan noted. Mr. Adams and his wife Michelle have personally donated $20,000 to the department and at press time, the crowdrise donation site had nearly matched that figure. Funding for the new apparatus bay is ongoing at this time, the chief noted. For added convenience, a trolley will be available to shuttle patrons between Burntwood and M Italian restaurants. CUYAHOGA FALLS – Not many restaurants offer a view of the river, but Burntwood Tavern, 2291 Riverfront Parkway, has plenty of tables overlooking the Cuyahoga River as if flows past the former dam powerhouse. Plans were unveiled last week for the newest restaurant in Solon - Rosina's Italian Kitchen - slated to open this spring. The Italian eatery will take over the building that formerly housed Pacos Tacos Tequila which closed about 16 months ago. It likely will breathe new life into the corner of SOM Center and Solon road where the nearby Tavern on 91 building remains vacant. Solon council OKs temporary signal at Portz Parkway and Aurora Rd. Rosina's is part of the Chef Art Pour Restaurant Group, best known for its Burntwood Taverns, one of which sits right around the corner on Solon Road. The new restaurant will offer "a warm gathering place for family and friends to enjoy old-school Italian favorites amidst a Tuscan farmhouse ambiance." It will be designed and built by Solon High School grad Christian Kalinyak, who has done other work for Burntwood. The upgrade will include stone columns, railing and a new open wooden arbor. Mardi Gras menu offerings include crawfish cakes with creole mustard sauce, seafood gumbo, shrimp po’ boy sandwich, Cajun cobb shrimp salad, jambalaya, crawfish cakes, scratch-made pecan pie topped with pralines and cream ice cream and the Hurricane, a signature drink special for the season, which consists of light and dark rum, fresh orange and pineapple juice, topped with grenadine. Chef Art Pour Restaurant Group has announced Burntwood Tavern’s 2018 Mardi Gras menu, which begins on Jan. 23 and runs through Fat Tuesday Feb. 13. The menu will be available at Burntwood’s nine Northeast Ohio locations as well as its new location in Naples, Fla.
Last but certainly not least is Burntwood Tavern, whose newsworthy happy hour I’ve featured in Ticket several times before. Happy hour here is daily from 3 to 6 p.m., making it an excellent stop pre- or post-movie on the weekends. Burntwood is rustic-chic inside, and the barroom has — in addition to bar and table seating — a couple of choice conversation areas with sofas and chairs. During happy hour, the entire menu of starter items is half-price, which makes them $3 to $6.50 apiece. They are: white bean chicken chili, fried pickles, prime rib chili, chicken sliders, tavern tater tots, black bean hummus, zucchini fritters, blackened shrimp tacos, deviled eggs, firecracker shrimp, tavern chips, angus beef sliders, calamari, sashimi tuna nachos and chicken quesadilla. I’ve had 90 percent of these and can vouch for their winning flavor, presentation and value. Also half-priced at happy hour are three flatbreads (Sicilian, margherita, avocado chicken). Similarly winning are the $5 cocktail specials during happy hour. All of the specialty cocktails are included at this price, among them a Moscow Mule, Old Fashioned, dirty martini and sangria. I’ve enjoyed the Mexican Grapefruit, with tequila, St. Germaine and grapefruit juice; Dark & Stormy, with rum, ginger beer, lime juice and mint; Adult Rootbeer, with Jameson, Kahlua, root beet and chocolate milk, and dessert-like Thin Mint Martini, with mint chocolate chip moonshine, Baileys and cream. Also during happy hour, bottles of beer are $3, and house wines are $4 a glass. Burntwood Tavern, 4320 Everhard Road NW, Jackson Township, 234-209-9746, www.burntwoodtavern.com.